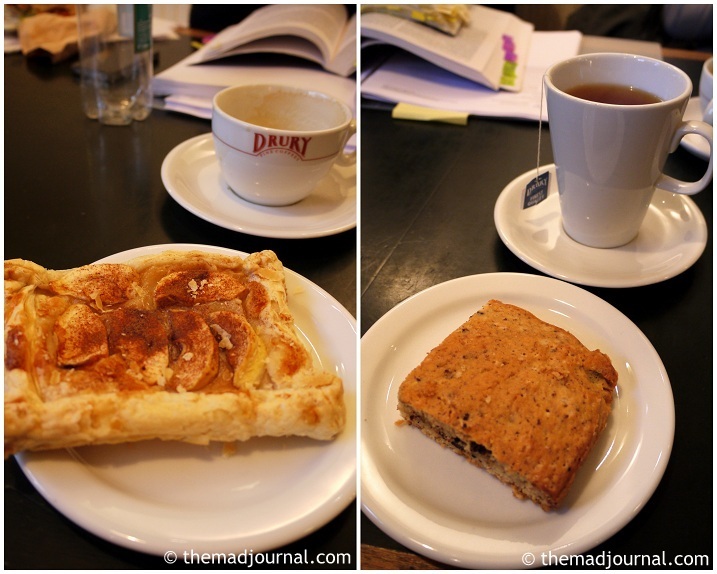 We found a nice cafe near V&A Museum of Childhood. We actually decided to go to the museum because I wanted to go to the cafe. There are seats outside and it looked very specious. 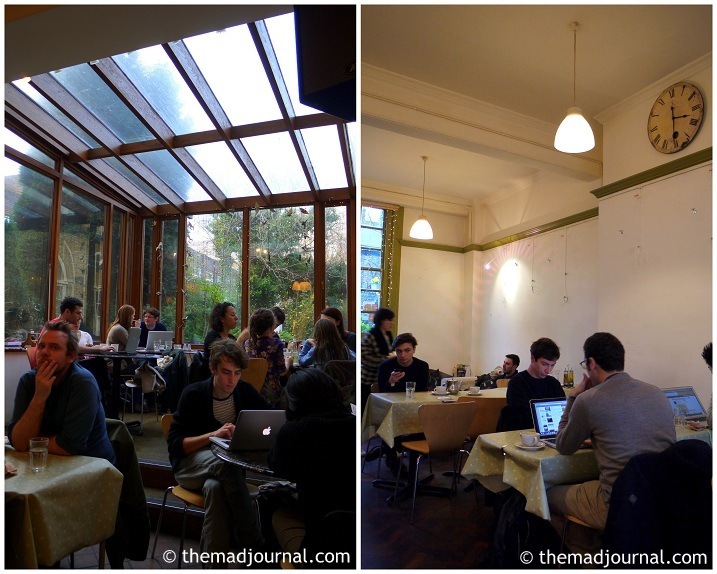 This cafe is in the building of the independent charity. They support local communities to lend their room for free or very cheap price. So, having tea in the cafe means to support this organization as well. The building itself is built in the 19th century and there is a beautiful garden. You can see it from the conservatory. And all of them are Vegetarian or Vegan menu. The cakes and pastries are also for Vegetarian or Vegan!! My partner took the cinnamon apple pastry. It was SO delicious!!! Usually pastry dough is dried and I don't like it, but this pastry was so fresh!!! And this cinnamon apple....... The apple was so sweet and suited with cinnamon!! We decided to go to the V&A Museum of Childhood for the last walk in East End. This is the sister museum of Victoria & Albert Museum in South Kensington. It's a toy museum full of nostalgic toys. Toys are in glass cases, but there are some toys you can play with if you pay. There were events for children everyday. It's like a paradise for kids!! but also I wanted to see the exhibition called Magic Worlds. My favorite magic worlds' exhibition! There was a big display of wonderland by the entrance. The exhibition itself is in First floor. They picked up the scene of the tea party from Alice in Wonderland. They put a table with a little cute tea set and some costumes! The boy in the centre must have been wearing the hat of the Mad Hatter. And there was a March Hare's headgear! How cute the tea party is! There were some scenes from Narnia, and other magic worlds' stories and they put costumes for each stories. And another famous Magic World story from UK is......you know which. What is she using for the potion? wings of a bat, legs of a spider, blood of snake.........he he he. My mom said that in Japan and my European friends said that in London. There was the photos of the famous case of the Cottingley Fairies. Anyway, I really enjoyed the exhibition with cute nostalgic toys and lovely disguised kids. 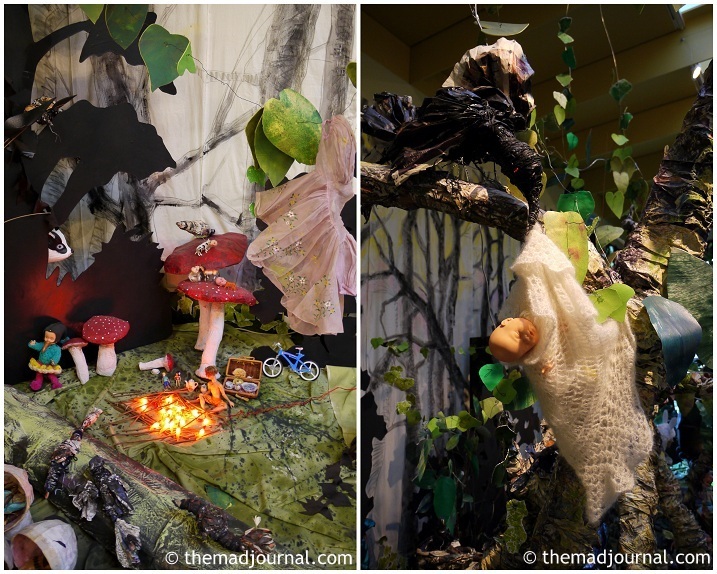 This Magic Worlds exhibition is until 4th March. Go and have a look if you like wonderland. I'll tell you about it next time. It's time to say goodbye to East End! I've loved this area since I came to UK. I used to go there every week, then I moved in my partner's flat which is in the centre of East End! I've been enjoying living there so much..... But I'm leaving East End. 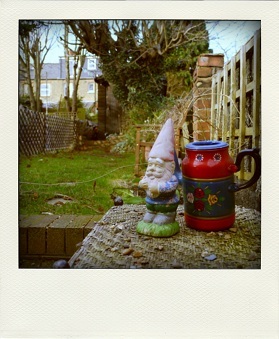 I'm moving to West London this Saturday. Last weekend was the last time to enjoy East End so we went for a walk. 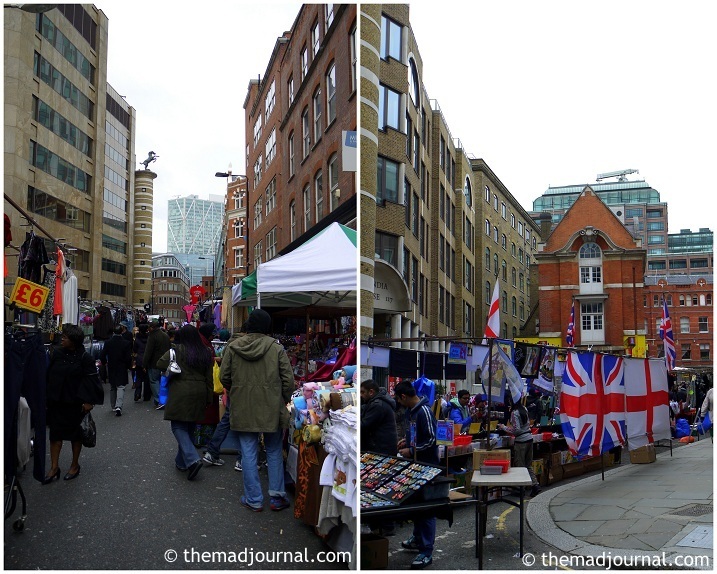 Petticoat Lane Market is just in front of our flat. so that some people misunderstood this is Brick Lane Market. There are lots of cheap stuff! Souvenirs, sometimes you can find Top Shop stuff. Old Spitalfields Market was just 2 minutes walk from our place. I went to the antique market every Thursday last year, which was great. I got many items for our new flat. You can still see the old rows of buildings. It's like you travel back to the Victorian era. East End is the scene of the Jack the Ripper's murders. There are lots of mystery walking tours walking around my flat and the street in the above photo. The very old pub, "The Ten Bells". It used to look very very ragged, but now it looks ordinary after they painted the walls. 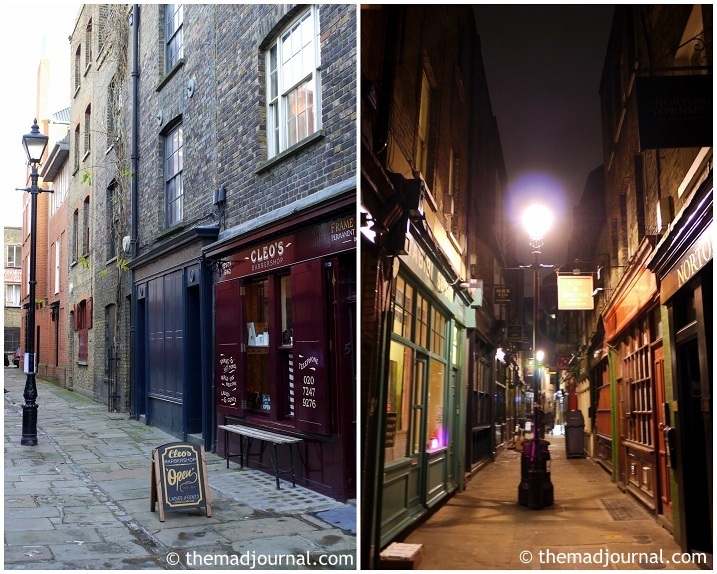 This pub used to be a favorite haunt of the prostitutes who were victims of Jack the Ripper. The flat upstairs is also a famous haunted house in London apparently. 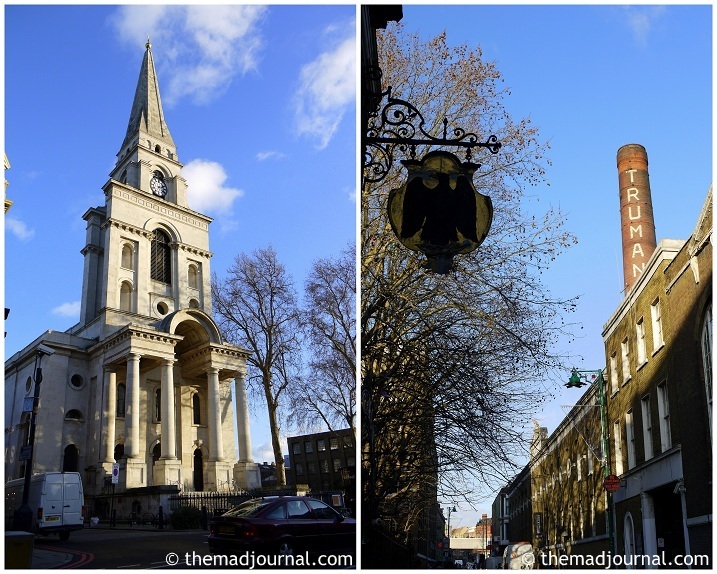 The white Christ Church, the big chimney of Truman in Brick Lane. They are the landmarks of East End. Both of them are photogenic. The town is full of street arts. The bagel shop (the left in the photo) is very famous and my favorite. I LOVE bagels. Their fresh bagel is the best!!! You can always see interesting things in Brick Lane. East End is still developing! New spots are coming and coming with dizzying speed! My favorite Columbia flower market. I used to come here almost every week to buy flowers, but now, time to say goodbye. There were lots of tulips. Spring has come! I love Columbia Road because there are lots of cool artistic people. I lived IN East End but there are still so many places we've never been and wanted to go! I think I come back here often after we move to West.